One of the most important values of the first university in Romania consists in its distinct identity, shaped throughout almost 150 years of academic excellence. In order for this identity to be assumed by every one of the 25.000 members of todays University, a coherent, unitary graphic representation is needed, which corresponds to the very core values which enliven the UAIC spirit. This is why the coat of arms and the flag of the university have been conceived. The graphical assembly that visually identifies with the Univerity is laded with symbols. Basically, each element signifies a stage in the history of the oldest university in Romania. Therefore, the Y shaped heraldic crotch simbolizes the three initiatives wich led to the foundation of the University. Cronologically, these are: the Trei Ierarhi Collegium, founded by Vasile Vodă Lupu; Academia Mihăileană, founded by Mihail Vodă Sturdza; the University, established by Alexandru Ioan Cuza. The central element is the Bible, the classic emblem of higher education. Another symbol can be found in the three shiny stars, which stand for the three faculties of the University at its foundation moment. 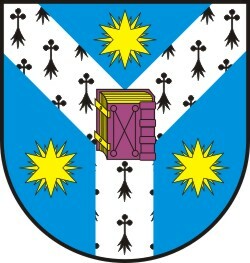 (Philosophy, Law and Sciences) Last but not least the colours can be considered symbolic elements, as the azure (blue) and the argent where used on the Cuza family shield. Therefore, the coat of arms gathers the historical and axiological aspects which individualizes the Alexandru Ioan Cuza University. 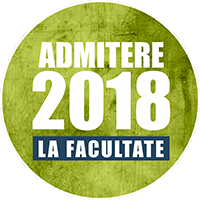 Here you can download the logo of the Alexandru Ioan Cuza University of Iași, both in Romanian and English, for the different situations in which you may need to use it. Each of the following links corresponds to an archive which contains the logo in the formats: EPS – Encapsulated PostScript, PNG – Portable Network Graphics, CDR – Corel Draw, SVG – Scalable Vector Graphics, AI – Adobe Illustration, PSD – Abobe Photoshop. The flag was designed in order to maintain a visual coherence in representing the identity of Alexandru Ioan Cuza University. 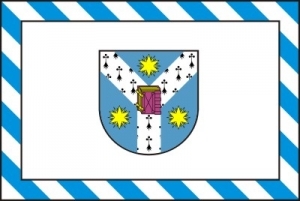 Therefore, the flag has a white background, with the coat of arms placed in the middle. You can find also a ribbon shaped stemming which contains the dominant colours of the coat of arms, namely azure (blue) and argent.